Background Physiotherapy, and speech and language therapy are emerging non-pharmacological treatments for refractory chronic cough. We aimed to investigate the efficacy of a physiotherapy, and speech and language therapy intervention (PSALTI) to improve health-related quality of life (HRQoL) and to reduce cough frequency in patients with refractory chronic cough. 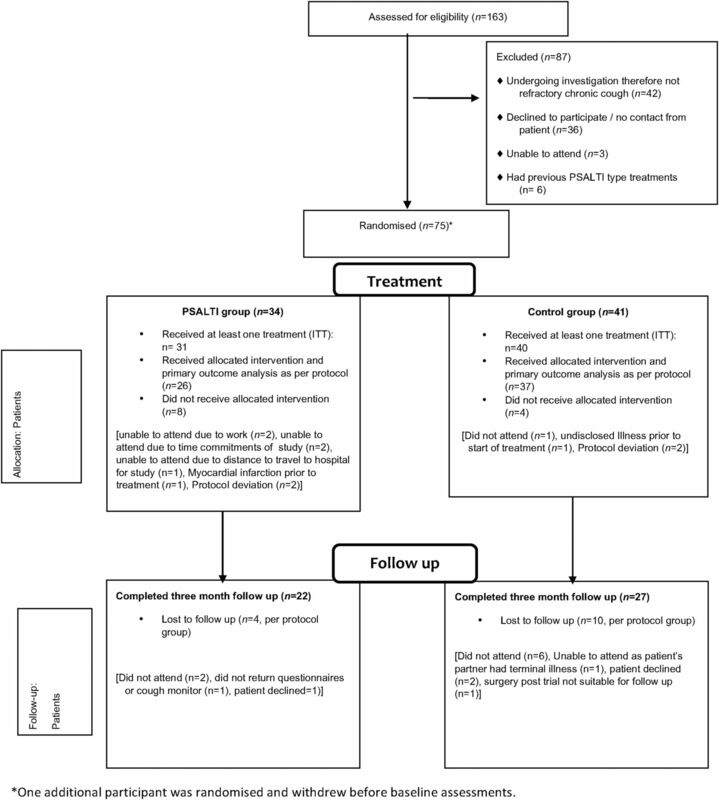 Methods In this multicentre randomised controlled trial, patients with refractory chronic cough were randomised to four weekly 1:1 sessions of either PSALTI consisting of education, laryngeal hygiene and hydration, cough suppression techniques, breathing exercises and psychoeducational counselling or control intervention consisting of healthy lifestyle advice. We assessed the change in HRQoL at week 4 with the Leicester Cough Questionnaire (LCQ). Secondary efficacy outcomes included 24-hour objective cough frequency (Leicester Cough Monitor) and cough reflex sensitivity. The primary analysis used an analysis of covariance adjusted for baseline measurements with the intention-to-treat population. This study was registered at UK Clinical Research Network (UKCRN ID 10678). Findings Between December 2011 and April 2014, we randomly assigned 75 participants who underwent baseline assessment (34 PSALTI and 41 controls). In the observed case analysis, HRQoL (LCQ) improved on average by 1.53 (95% CI 0.21 to 2.85) points more in PSALTI group than with control (p=0.024). Cough frequency decreased by 41% (95% CI 36% to 95%) in PSALTI group relative to control (p=0.030). The improvements within the PSALTI group were sustained up to 3 months. There was no significant difference between groups in the concentration of capsaicin causing five or more coughs. Interpretation Greater improvements in HRQoL and cough frequency were observed with PSALTI intervention. Our findings support the use of PSALTI for patients with refractory chronic cough. Trial registration number UKCRN ID 10678 and ISRCTN 73039760; Results. 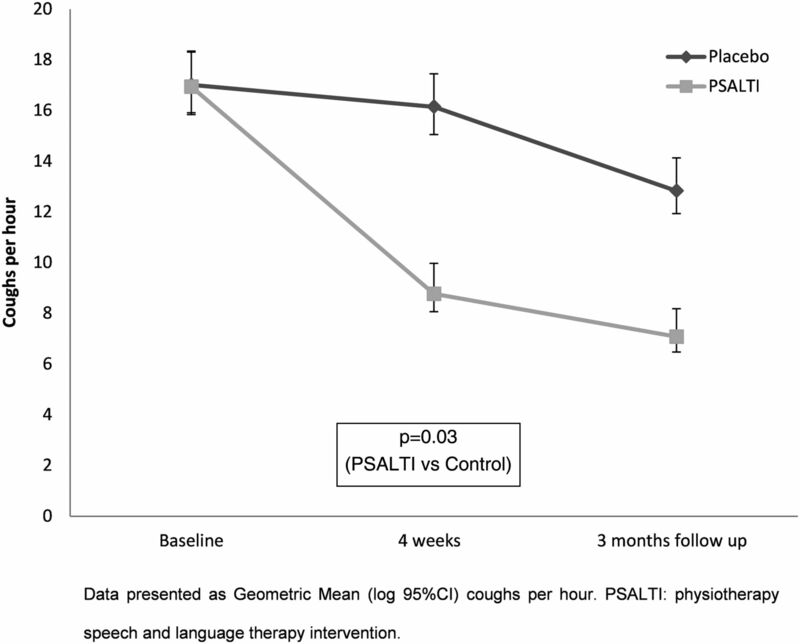 Is physiotherapy, and speech and language therapy intervention (PSALTI) effective for patients with refractory chronic cough? PSALTI significantly reduced objective cough frequency and significantly improved health related quality of life when compared with control intervention. This study is the first multicentred randomised controlled trial that demonstrates improvements with PSALTI compared with control intervention using objective outcome measures. Non-pharmacological therapies for refractory chronic cough have shown promising results in a few studies and no significant adverse effects.17 Non-pharmacological therapies are generally delivered by physiotherapists or speech and language therapists, and key components include education, cough suppression techniques, including breathing exercises, vocal hygiene and hydration, and psychoeducational counselling.15 ,17–23 Vertigan et al19 conducted the only randomised controlled trial of a non-pharmacological intervention for refractory chronic cough and found significantly greater improvements in symptoms of cough for speech pathology management compared with control (general healthy lifestyle advice). The benefits of speech pathology management on objectively measured cough frequency, cough reflex sensitivity and health-related quality of life (HRQoL) have not been assessed in a controlled clinical trial, limiting the generalisability of the findings. The minimal clinically important difference of the cough symptom score used in this study has not been defined. Furthermore, the longer term effect of therapy is not known.17 A recent study by Patel et al20 investigated cough-suppression physiotherapy for refractory chronic cough in 23 participants and found a significant improvement in cough-related quality of life, but this study also did not include a control intervention. This study therefore aimed to assess the effect of an intervention using both physiotherapy and speech and language therapy techniques (physiotherapy, and speech and language therapy intervention, PSALTI) on HRQoL, objective cough frequency, cough reflex sensitivity and cough severity using a randomised controlled design. A multicentre, single-blinded randomised controlled trial was conducted across three hospitals in the UK (King's College Hospital NHS Foundation Trust, Lancashire Teaching Hospitals NHS Foundation Trust and Northumbria Healthcare NHS Foundation Trust). Two further sites, Royal Brompton & Harefield NHS Foundation Trust and Guy's and St Thomas' NHS Foundation Trust) were recruitment-only sites, and participants were referred to King's College Hospital to receive the intervention. The study was undertaken between December 2011 and April 2014. Eligible participants were identified as adults with chronic cough (defined as duration >2 months), with normal chest X-ray, minimal sputum production (<10 mL sputum a day) and who had negative investigations and/or failed treatment trials for asthma, gastro-oesophageal reflux disease and rhinitis, as per British Thoracic Society guidelines.1 Participants were excluded if they had an upper respiratory tract infection in the past four weeks, were taking ACE inhibitors medication, were current smokers or had a known respiratory disease (such as lung cancer, pneumonia, pulmonary fibrosis, sarcoidosis, pleural effusion, bronchiectasis). Participants were also excluded if they had vocal cord nodules, malignancy or evidence of active aspiration. Once participants had given written consent and completed baseline assessments, they were registered into the randomisation service provided by the King's Clinical Trials Unit, King's College London. This prevented foreknowledge of treatment assignment for the study researchers. Group allocation was concealed from participants until they had completed the study and all post-intervention assessments. Participants were block-randomised, stratified by age (above and below 50 years old) and gender. Participants attended weekly sessions and received one-to-one standardised healthy lifestyle advice from a healthcare professional (nurse, physiotherapist or speech and language therapist) over 4 weeks. The control intervention was based on that used in the trial reported by Vertigan et al.19 The initial session covered general advice on exercise and physical activity, second session dietary and nutritional advice, third session stress management and fourth session relaxation. The material covered in each session was based on healthy lifestyle advised by the UK Department of Health and National Health Service.24–26 The sessions were standardised for all sites by using the same written prompts for therapists and educational information. Face-to-face training was provided for all site therapists who delivered the healthy lifestyle intervention. The duration of all trial sessions was 45 min, except the initial session which was 1 hour. Participants attended weekly sessions and received one-to-one treatment from a healthcare professional (physiotherapist or speech and language therapist) over 4 weeks. Session durations were the same as for the control group. The intervention was based on previous speech pathology management and cough suppression physiotherapy studies for refractory chronic cough reported by Vertigan et al19 and Patel et al,20 respectively (table 1). The first session focused on educating participants about chronic cough, introduction to laryngeal hygiene and hydration techniques and cough suppression/distraction techniques. The second and third sessions covered cough suppression techniques in more detail, including breathing exercises (table 1). Nasal douching or steam inhalations were recommended to participants with nasal congestion. In the third session, psychoeducational counselling techniques were covered with the aid of an information booklet developed jointly by the main study researcher and clinical psychologist at the primary research site. The fourth session consisted of reinforcing all aspects of PSALTI. All components of PSALTI were delivered; however, the focus and emphasis on individual techniques varied for each participant, determined by the treating therapist. An Airway clearance technique (Active cycle of breathing technique, ACBT) was included in the PSALTI treatment if the participant's sputum production was close to the upper limit of sputum exclusion criteria. The standardisation of treatment between different hospitals was increased by the use of written treatment plans and educational material. All therapists delivering the treatment were trained in PSALTI prior to commencing the study by the main study researcher. HRQoL was assessed with the Leicester Cough Questionnaire (LCQ) at week 4, the primary endpoint.8 The LCQ is a validated 19-item cough-specific health-related quality of life questionnaire. Overall scores range from 3 to 21, with a higher score indicating a better HRQoL. The minimal important difference for LCQ is 1.3.27 Participants independently completed questionnaires at baseline, at 4 weeks (after fourth treatment session) and at 3-month follow-up. Questionnaires were then placed in sealed envelopes to avoid influencing the treating therapist. Secondary endpoints were assessed at baseline, 4 weeks and 3 months. Objective cough frequency was assessed with the Leicester Cough Monitor (LCM), a validated, objective, automated and ambulatory cough monitoring device.28 The LCM consists of an MP3 recording device (Phillips 662 MP3 recorder, UK), external microphone and automated cough detection software. The LCM has been used in previous clinical trials of gabapentin and erythromycin.12 ,29 Participants wore the device for 24 hours at baseline, at 4 weeks (after fourth treatment session) and 3-month follow-up and were instructed to resume their normal daily activities during this time period. The number of coughs per hour (CFperhour) was recorded. Capsaicin cough challenge was assessed in a subset of the participants (Kings College Hospital Foundation Trust and Northumbria Healthcare NHS Foundation Trust) to measure participants' cough reflex sensitivity at baseline and at 4 weeks (after fourth treatment session). Doubling concentrations of capsaicin solution ranging from 0 (saline), 0.49 to 1000 µm were administered as per European Respiratory Society guidelines.30 A dose–response capsaicin cough testing method was used.30 The nebuliser output was set to 0.01 mL/breath. The test was discontinued when five or more coughs were induced (C5). In addition, the dose that induced two or more coughs (C2) was recorded. All protocols were approved by the London-Chelsea National Research Ethics Service (NRES) Committee (11-LO-0504). All participants provided written informed consent, and the study was registered with the UK Clinical Research Network (UKCRN ID 10678) and ISRCTN (73039760). The funding bodies had no role in study design, collection, analysis and interpretation of data, in the writing of the report or in the decision to submit for publication. Power calculations for the primary outcome (LCQ score) were performed based on estimates from a previous study,37 reporting a mean LCQ score in patients with chronic cough of 14.03 (SD: 3.87). Group sample sizes of 33 in each group achieve 80% power with a significance level of 5% to detect a LCQ change of 2.7 (seen in our pilot study). Allowing for a 25% dropout, we aimed to recruit 88 patients in total. For each of the variables analysed, univariate descriptive statistics were summarised by randomised group to provide an overview of the data. Summary measures for the baseline characteristics of each group were presented as mean and SD for continuous ‘approximate’ normally distributed variables, medians and IQRs for non-normally distributed variables, and frequencies and percentages for categorical variables. Univariate analyses were performed to compare study group using appropriate statistical tests according to the type and the distribution of the data: independent t-test or Mann-Whitney for continuous variables. Cough frequency and capsaicin data were log-transformed prior to analysis. Primary efficacy analysis, change in LCQ at week 4, was based on analysis of covariance (ANCOVA) adjusted for the baseline LCQ measurements. The ANCOVA analysis was repeated to adjust for centre and specialty of the treating therapist. The analysis used data from the intention-to-treat (ITT) basis population, which included all randomised participants who had received at least one treatment session. In this analysis, only observed data were included, and no imputation was used for missing data. We also performed an analysis on a per-protocol population which included participants who completed end-of-treatment (week 4) cough assessments and who did not deviate from the protocol (established before unmasking). Sensitivity analyses were performed for missing data according to different predefined populations using ANCOVA, with multiple imputations (see online supplementary appendix methods and online supplementary appendix - table 1).38 Similar sensitivity analyses were also performed for objective log-transformed cough frequency endpoints (see online supplementary appendix methods and online supplementary appendix - table 2). The secondary efficacy analysis used data from the ITT population. In these analyses, ANCOVA was used adjusting for baseline variables, and only observed data were included without imputation for missing data. A value of p<0.05 was considered statistically significant. All analyses were made using STATA V.12 software (StataCorp LP, College Station, Texas, USA). Seventy-five participants were randomised and had baseline assessments. One additional participant was randomised to the PSALTI group but did not attend baseline assessments. Four participants did not receive any treatment (PSALTI group (n=3): myocardial infarction prior to treatment, unable to travel to hospital and insufficient time for the study; control group (n=1): undisclosed illness prior to start of treatment). The ITT population for LCQ primary analysis consisted of 71 participants (figure 1, and see online supplementary appendix methods and online supplementary appendix - table 1). A total of four participants in the control group and eight participants in the PSALTI group did not receive or complete all treatments for reasons stated in figure 1. Forty-nine participants completed 3-month follow-up. The consort study flow is described in figure 1. The baseline characteristics of the randomised participants are described in table 2. The groups were well matched, with the exception of SF-36 PCSs (higher in the control group). There was an improvement in the mean total LCQ score at 4 weeks with PSALTI; baseline 10.4 vs 14.4 at 4 weeks , mean difference 3.4, p<0.001. This improvement was larger than that in the control group; baseline mean 11.9 vs 13.4 at 4 weeks, mean difference 1.66, p<0.001 (see online supplementary appendix—table 3). Total LCQ score at 4 weeks improved by a mean 1.53 (95% CI 0.21 to 2.85) units more in the PSALTI group than that in control (p=0.024), table 3. When adjusted for centre and specialty of therapist, the LCQ score at 4 weeks improved by a mean of 1.53 (95% CI 0.20 to 2.86), p=0.024. The improvement in LCQ with PSALTI was consistent in the per-protocol and sensitivity analyses (see online supplementary appendix—table 1). The LCQ improvement was sustained from week 4 to 3 months for both groups, but there was no significant difference between groups at 3 months (table 3). The LCQ scores and within-group differences are presented in online supplementary appendix - table 3 and table 4 in main article respectively. Primary outcome LCQ data (baseline or week 4) were missing in 6.7% of participants. There were no adverse or serious adverse events reported for both interventions. There was a greater reduction in cough frequency after 4 weeks of treatment in the PSALTI group; geometric mean (SD) 17.0 (2.4) to 9.0 (3.3) coughs per hour (p=0.002) vs 17.0 (2.3) to 16.0 (2.2) coughs per hour after control (p=0.205) (table 4). The control-adjusted decrease in cough frequency per hour in PSALTI was 41% (95% CI (36% to 95%), p=0.030, ANCOVA) at 4 weeks in the primary ITT analysis (table 3). This reduction was also sustained at 3 months (figure 2). The reduction in cough frequency with PSALTI was consistent in per-protocol and sensitivity analyses (see online supplementary appendix—table 2). Change in objective cough frequency in physiotherapy, and speech and language therapy intervention (PSALTI) and control groups. There were no significant between-group differences for change (week 4 minus baseline) in VPQ, depression, anxiety or SF-36 (table 3). There was a greater reduction in VAS cough severity in the PSALTI group compared with control (p=0.084, table 3). Cough severity VAS within both groups between week 4 and baseline; was significantly reduced control: p=0.007, PSALTI p<0.001 (table 4). Sixty participants (80% of ITT group) underwent capsaicin cough challenge. No significant differences between groups were observed for C2 (p=0.575) or C5 (p=0.512) (table 3). There was a within-group reduction in C5 with PSALTI (p=0.035), but not with control (p=0.469) (table 4). This study evaluated the efficacy of a physiotherapy, and speech and language therapy intervention for patients with refractory chronic cough in a randomised controlled trial. There was a clinically and statistically significant improvement in health-related quality of life with PSALTI compared with control intervention. This was supported by a significant reduction in cough frequency measured objectively. The improvement in health-related quality of life was sustained at a 3-month follow-up visit. There was no significant change in cough reflex sensitivity between groups. Our findings represent an advance from those reported in an earlier study by Vertigan et al.19 Our study is the first multicentre trial of non-pharmacological treatment reported in chronic cough and has the potential to provide the evidence base for access to therapy. Vertigan et al19 reported a statistically significant reduction in cough symptoms scores, but did not include HRQoL or objective assessment with cough frequency monitors. In contrast, we assessed HRQoL, objective cough frequency, cough severity VAS and cough reflex sensitivity. We were also able to demonstrate both a clinically and statistically significant improvement in our primary endpoint, because the minimally important difference (MID) of the LCQ has been defined.27 We have shown that the benefits of PSALTI are sustained after discontinuation of therapy, in contrast to Vertigan et al19 who did not report follow-up data for their participants. One of the strengths of our study was the involvement of multiple centres, the use of standardised treatment protocols and the inclusion of both physiotherapists and speech and language therapists delivering the treatment. HRQoL, as assessed with the LCQ, was selected as the primary outcome measure because it is perhaps the most important outcome measure from the patient's perspective.7 ,8 ,39 The HRQoL of our participants was severely impaired, affecting physical, psychological and social domains, comparable with that reported in previous studies of refractory chronic cough.29 ,40 The improvement of HRQoL with PSALTI was large, LCQ 3.4 units. This improvement was greater than the MID of the LCQ, 1.3 units,27 and that reported for gabapentin therapy in patients with refractory chronic cough (LCQ improvement 2.5 units).12 The improvement with PSALTI was smaller when adjusted for the change in the control group (LCQ score, control group 1.66 units). HRQoL also improved with control intervention, but to a lesser extent than PSALTI. The aim of the control intervention was to provide participants with an equivalent quantity of clinical attention to the PSALTI intervention. This is additional to what most patients with refractory chronic cough would receive as usual care, since physiotherapy, and speech and language therapy services are not widely available for refractory chronic cough. It is possible that the control intervention had an antitussive effect and that the difference between PSALTI and control group may have been larger if compared with usual care (no active treatment). The control intervention was intended to be non-specific, but it is possible that some of its components such as stress/anxiety and lifestyle management may have had a positive benefit, particularly on the central sensitisation pathways that regulate cough. The improvement in cough frequency assessed objectively with 24-hour cough monitoring supports the improvement in HRQoL with PSALTI occurred because of an actual reduction in coughing. Cough frequency outcome measures are increasingly being used as endpoints in clinical trials to validate the efficacy of antitussive therapy.41 ,42 The LCM has been reported to be a valid method of counting coughs objectively.28 ,43 An advantage of cough monitors over subjective measures is that they are not susceptible to the patient's or clinician's perception of cough severity. PSALTI was associated with an additional 41% reduction in cough frequency, which can be considered a large change, and is comparable with that observed with pharmacotherapy such as the P2X3 inhibitor AF-219.13 The minimal clinically important difference for cough monitor frequency in chronic cough has not been studied. The reduction of cough frequency was comparable with the minimal important difference reported for acute cough.42 We also assessed cough severity subjectively with VAS. There was a reduction in cough severity with PSALTI compared with control intervention, and the difference approached statistical significance. The reason for the discrepancy in effect size between HRQoL and VAS findings is not clear. A larger study would be needed to confirm whether PSALTI impacts cough severity assessed with VAS. Despite their widespread use, VAS have been poorly validated in comparison with HRQoL questionnaires and cough monitoring tools, as acknowledged by the American College of Chest Physicians' cough guidelines.31 There were no between-group differences in reported voice-related problems. We chose the VPQ, a patient-reported questionnaire, to assess voice, since it has been reported to have excellent internal consistency, repeatability and responsiveness.44 There are alternative questionnaires available to assess voice such as the voice handicap index and voice symptom scale.45 ,46 A comparison of these scales by Webb et al44 concluded all were valid and reliable questionnaires for assessing patient's perceived voice dysfunction. There were no adverse events associated with PSALTI, specifically no episodes of pulmonary infections. Patients with significant sputum production were excluded because of the potential risk of pulmonary infections associated with cough suppression. Longer term data with PSALTI are required to fully assess its safety. The mechanism by which PSALTI reduces cough is not clear, nor which component of PSALTI is most effective. PSALTI was not associated with a reduction in cough reflex sensitivity assessed with capsaicin when compared with the change in control group. There was however a significant within-group improvement in C5 in the PSALTI group, which indicates a reduction in cough reflex sensitivity, consistent with the studies by Ryan et al21 and Vertigan et al,15 who reported a reduction in cough reflex sensitivity with speech pathology management. The studies by Ryan et al21 and Vertigan et al15 however did not have a control group (no speech pathology management) for comparison. It is possible that we did not find a between-group difference in cough reflex sensitivity due to the small sample size of participants that underwent capsaicin cough challenge testing; further studies are needed to investigate this. We investigated PSALTI in patients with refractory chronic cough. Our participants had a troublesome chronic cough despite numerous investigations and trials of therapy. A refractory chronic cough may also be referred to as idiopathic, difficult-to-treat, unexplained, sensory neuropathic and vagal neuropathy cough, although some differences exist between groups.47 PSALTI-type treatments have only been studied in patients with refractory chronic cough once they have undergone extensive investigations and/or trials of therapy. The role of PSALTI-type treatments earlier in the management of such patients has not been explored and needs to be studied. The efficacy of PSALTI is also unknown in other difficult-to-treat coughs, such as that associated with lung cancer, idiopathic pulmonary fibrosis and sarcoidosis, and this should be investigated. Further studies are needed to explore the optimum frequency and duration of PSALTI and other non-pharmacological treatments. There were some limitations to our study. The study was single-blinded. It was not possible to blind the treating therapist to the intervention the participant received. The possibility that unconscious bias could have been conveyed to participants during the course of intervention cannot therefore be discounted. Double-blinding is not possible in studies of behavioural intervention. The potential bias was minimised by asking participants to complete their primary outcome measures independently from the treating therapist, and participants remained blinded until after completion of the final post-intervention outcome measures. Capsaicin cough reflex tests in some participants were performed by the treating therapist, but it is unlikely that this influenced the outcome, since our findings suggest no change with intervention when adjusted for control. Some components of PSALTI were tailored to the individual, according to clinical need. This may be considered both a limitation and strength, since it reduces the uniformity of intervention delivered, but reflects real-life clinical practice addressing the needs of an individual. Our study did not meet the intended sample size. This may have affected the power of our analyses and undermined the robustness of the results. Despite this, there was a clinically and statistically significant improvement in the primary outcome measure with PSALTI. Thirty-six (22%) of the participants screened were uncontactable or declined to participate. The clinical characteristics of participants recruited were however consistent with the previously reported studies of refractory chronic cough.29 A significant number of participants were lost to follow-up for the 3-month follow up visit where secondary endpoints were assessed. This was largely from the control group. There was no significant difference in LCQ between groups at 3 months; this could be a consequence of a smaller sample size or a reduction in the long-term benefit of PSALTI following cessation of therapy. The long-term benefits of PSALTI need to be confirmed in larger studies. It is possible that some of the benefits of PSALTI may have been a consequence of intense supervision. The control intervention was however identical in frequency and duration of visits. In conclusion, PSALTI is an effective therapy for patients with refractory chronic cough. It is associated with a significant improvement in health-related quality of life and cough frequency, compared with control. The optimal components of PSALTI and number of sessions of therapy need to be determined in future studies. The effectiveness of PSALTI used earlier in the treatment of chronic cough and other patient groups with difficult-to-treat cough should be evaluated. There is also a need for improved access to physiotherapy, and speech and language therapy services for patients with refractory chronic cough. This study represents independent research supported by the National Institute for Health Research (NIHR)/Wellcome Trust King's Clinical Research Facility and the NIHR Biomedical Research Centre and Dementia Unit at South London and Maudsley NHS Foundation Trust and King's College London. The views expressed are those of the authors and not necessarily those of the NHS, the NIHR or the Department of Health. All authors would like to acknowledge a number of key people who helped with this trial. The authors thank Dr Nicholas Hart for his help with applying for NIHR grant funding; Janet Mills and Maureen Armstrong for their help with recruitment of participants and study/data management at Royal Preston and North Tyneside Hospitals, respectively; Natasha Muzengi, Rachel Harding, Aliya Kaaba and Katie Pidgeon who all helped with conducting assessments and participant recruitment at King's College Hospital and Dr Jane Hutton, Consultant Clinical psychologist at King's College Hospital and the Institute of Psychiatry who helped to develop the psycho-educational counselling information booklet which was used as part of PSALTI. , On behalf of the British Thoracic Society Cough Guideline Group. Recommendations for the management of cough in adults. Thorax 2006;61(Suppl 1):i1–24.
. Diagnosis and management of cough executive summary: ACCP evidence-based clinical practice guidelines. Chest 2006;129(1 Suppl):1S–23S.
. Chronic cough: a tutorial for speech language pathologists. J Med Speech Lang Pathol 2007;15:189–206. Department of Health. Start active, stay active. UK: Department of Health, 2011. NHS. Eight tips for healthy eating. 2013. http://www.nhs.uk/Livewell/Goodfood/Pages/eight-tips-healthy-eating.aspx (accessed 05/10/2015). NHS. Relaxation tips to relieve stress. 2013. http://www.nhs.uk/Conditions/stress-anxiety-depression/Pages/ways-relieve-stress.aspx (accessed 05/10/2015).
. Optimising outcome assessment of voice interventions, I: reliability and validity of three self-reported scales. J Laryngol Oto 2007;121:763–7. Contributors Conception/design of work: RG, SSB, KKL and HB; Study recruitment: SAFCM, SSB, SMP, SJF, JHH and KFC; Assessments/treatment delivering in the trial: SAFCM, LC, JE and SL; Data analysis: SAFCM, AD, AP and SSB; Drafting manuscript: SAFCM, RG and SSB; Revised manuscript: All. Funding This work was supported by a grant from the Chartered Society of Physiotherapy Charitable Trust, UK (Award PRF 10/4). Additional funding was obtained from NIHR-CRN. SSB was supported by King's College Hospital NHS Foundation Trust and London National Institute for Health Research (NIHR)/Wellcome Trust King's Clinical Research Facility and the NIHR Biomedical Research Centre and Dementia Unit at South London and Maudsley NHS Foundation Trust and King's College London. AD acknowledges financial support from the National Institute for Health Research Biomedical Research Centre at Guy's and St Thomas' National Health Service (NHS) Foundation Trust and King's College London. AD also acknowledges support from the NIHR Collaboration for Leadership in Applied Health Research and Care South London (CLAHRC South London). The views expressed are those of the authors and not necessarily those of the NHS, the NIHR or the Department of Health. Competing interests AP reports grants from NIHR, personal fees from Industry (Allergan, Merz and IPSEN), grants and non-financial support from Industry (Allergan and Biometrics), outside the submitted work. KFC has no disclosure for the work under consideration. Outside this work, he has received honoraria for participating in Advisory Board meetings regarding treatments for asthma and COPD for GSK, AZ, Novartis and J&J, and has received grant funding through his institution from Pfizer, GSK and Merck. Ethics approval London-Chelsea National Research Ethics Service (NRES) Committee.